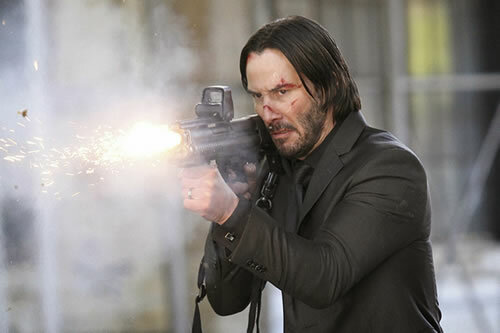 Lionsgate has announced they’ll be releasing John Wick starring Keanu Reeves on October 24, putting it up against Universal’s board game adaptation Ouija and the Bill Murray and Melissa McCarthy starrer St. Vincent. The film, directed by stuntmen turned directors, David Leitch (Jupiter Ascending) and Chad Stahelski (The Hunger Games: Catching Fire), centers on a retired hitman (Reeves) whose murderous instincts are reawakened when a thug steals his 1969 Ford Mustang and in the process kills the dog given to him by his late wife. The film co-stars Adrianne Palicki, Willem Dafoe, Michael Nyqvist and Bridget Moynahan. I don’t think the studio is thinking this is some sort of awards move, instead it appears to be a counter-programming decision and if the synopsis suggests anything, perhaps it will be a good dose of R-rated, tough guy entertainment. Just below is a video shot from the set and you can see some pictures right here.